Yoga is a wonderful preventive health and spiritual growth practice, and it can be adapted to meet the various needs of a wide range of bodies and situations. Yoga may not be suitable for certain health conditions and is not recommended during acute injury. If you have an injury or chronic health condition, please check in with your physician first to learn whether yoga is considered a good fit for you. Your physician or physical therapist can give you guidelines about which actions or shapes to avoid. Once you’ve done this, your teacher will be happy to make alternative suggestions for postures that are more suitable for you. 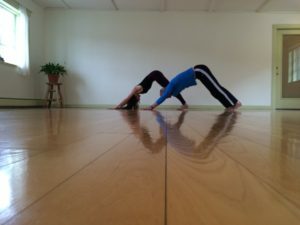 At Shelburne Falls Yoga, we encourage students to modify practices in any way, whether in response to a physician’s recommendation or in response to your own intuition about what is and is not working for you. It is important to remember that your yoga instructor is not trained to diagnose injuries or health conditions and must refrain from doing so in order to remain within an ethical scope of our practice.